Our sew in made with love by grandma labels are a perfect finishing touch to any handmade item, there are several standard designs and you can also ask us to produce something custom for you based on a design you may have in mind e.g. sketched or an existing logo etc. We primarily produce name labels and our personalisation options for those includes 10+ fonts, 20+ solid print colours and 50+ optional motifs, these labels can also use the same fonts and print colours if needed. 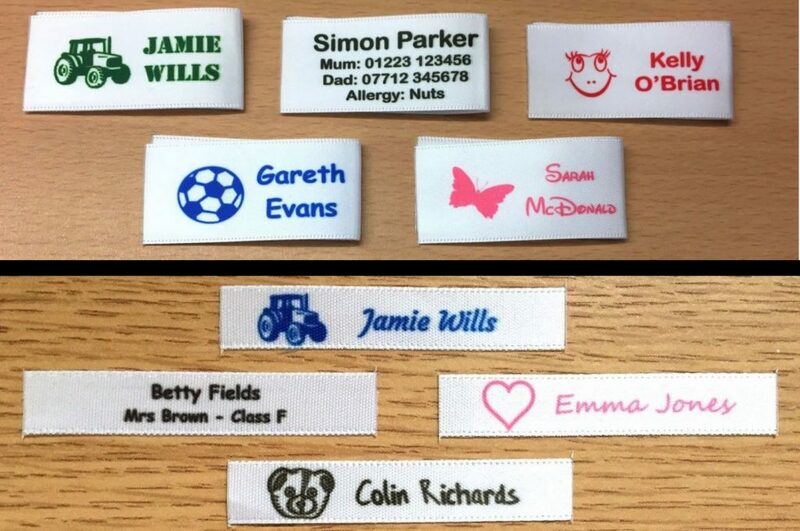 Over the years we have sold thousands of name labels to many hundreds of happy customers, our sew in labels are made from a high quality satin ribbon material and won’t fade. We have developed our own bespoke production process which allows us to offer very durable, highly personalised great looking labels to you which isn’t something similar sellers and their products can match. If needed we can print in full colour e.g. your labels can have black text and a red love heart etc. All of our labels are produced in Cambridge UK, we can provide a preview before shipping and we always save each design in case you would like to re-order. Each label we produce is pre-cut and sealed to prevent fraying which saves you time as there is no need to cut as they can be sewn straight in etc. In terms of testing our labels have been washed in both bio and non-bio washing detergents, very hot 100c+ temperatures and even soaked in concentrated bleach with no adverse effects.